The farmers journal article that I published recently caused some mild upset, rumour has it! Who’d a thought it? The guy who somewhat irregularly but regularly enough sits on the inside backpage would get a claim to fame. 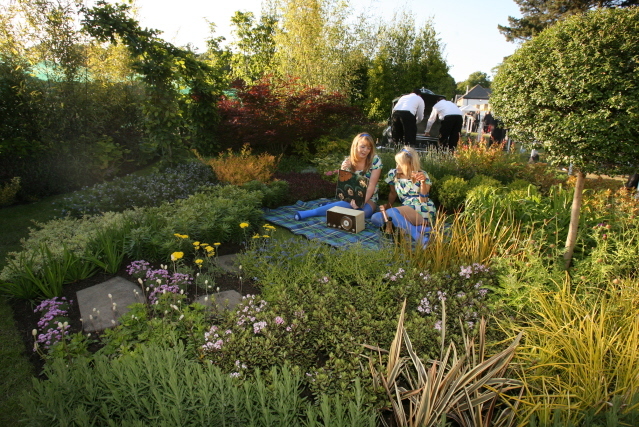 I know I’ve been on irish television before thanks to athena media who really made a unique minded dubliner look or a least feel a little more accepted into irish [horticultural] society! The point of the article was that if you are going to move to old style farming country that you build a house and [here’s the important bit] either blend it into the landscape or do not touch the surrounding landscape. In a word take the existing ecosystem into consideration and try not to meddle with the balance of nature. Its seems a more mature but also new genre will move in with the big machine pull out the hedgegrows and build brand new walls and a pentagon esque style house. I personally have no problem with that but when it’s surrounded by farmland – it’s not, always, so pretty. I design gardens and some of them are a little different, but depending on the area and the surrounds depends on the fianl planting sheme of the more integral pieces of what make up a complete design. My article go live for selfbuild.ie Ireland magazine but I’m not too sure for all from the farmers journal. Anyhow for those of you who want to hear of some farming controversy please pardon my sense of humour and enjoy below. I spent most of my not so far distant youth living in the ‘country’ and as most of you know by now where I live is still, pretty much, farmland. There is however great movement in the old town and houses are popping up just about everywhere. Speaking to a farming neighbour of mine recently, we were conversing on the topic of buildings that look so out of place within their rural setting, kids being driven to school in super jeeps, rather than walking – the usual groan over a pint. 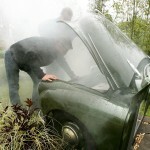 It was mentioned that he had had a recent complaint about the smell from the farm and was asked to do something about it! Conversation turned to fast cars stuck behind tractors and the frustration ‘they’ must have in their lives! We came up with the solution that ‘they’ should live on a motorway. Although the dream may have been to live in the ‘countryside’ it seems changing Ireland has changed more than I realised. No disrespect intended to any person agus Tá Fáilte Romhat go dtí Baile Bachaile. The biggest change in my eyes has to be land reclamation. The house must be bigger and so must the drains I am sure. But the hedge-grow is being removed and rather than being replaced with native species large walls take their place. Planning may have a role to play in all of this but with or without those county council departments as your say so, nature depends greatly on nature. If you are new moving to the old, please replenish and replace as nature intended or as it was before you got here. 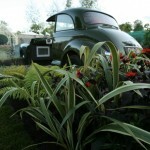 Planting season for whips and trees is almost upon us, it isn’t that expensive and if you ask nicely I’ll even tell you what to plant and when to suit your home. 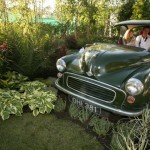 Get back to your roots – plant a hedge this October and as always – enjoy! Part of november will see myself and 45 others and some colleagues of mine] travel to south africa to build a garden with the Niall Mellon trust. 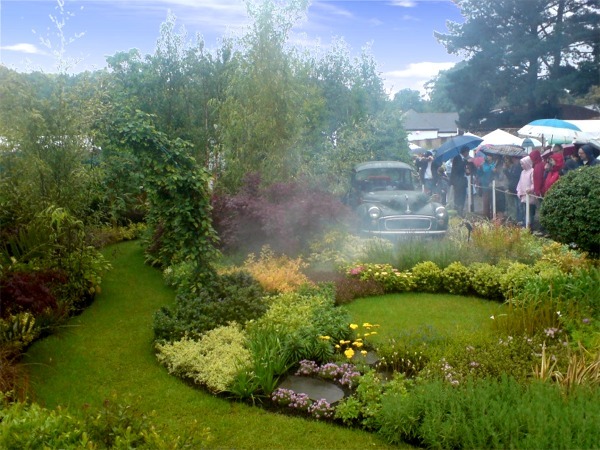 NB: just to clarify – the garden was designed and the build fully organised by Dominic Loughran, his garden of hope team & The Niall Mellon Township Trust. 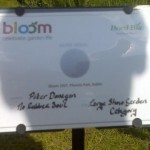 The sponsorship for this will be paid by Peter Donegan Landscaping Ltd. Turns out the boss ain’t so bad after all. Further information is available here. 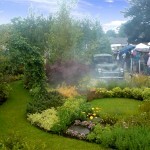 The garden of hope project team have set up a weblog. 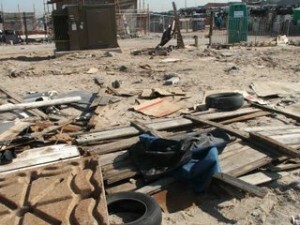 If you’d like to donate tools or anything you think might be useful, make yourself famous. [when I say donate tools I dont mean in the Irish sense and post over people you don’t like]. Whilst the sponsorship/ costs for my trip have been paid by the boss I am informed that people can still give away their hard earned dollars free of charge. If your loaded and reading this you probably don’t have a shovel or know how to get it started so go ahead make yourself feel better. My original post, on my website said 25 people, this one says 45 – I’m reliably informed it’s over 60 people involved. To those of you who have given a few bob on my behalf – It’s so much appreciated, [check comment from Dominic below] I’m very proud. The pic above is the site we will develop in one week. Slan go foill agus go raibh míle maith agaibh. 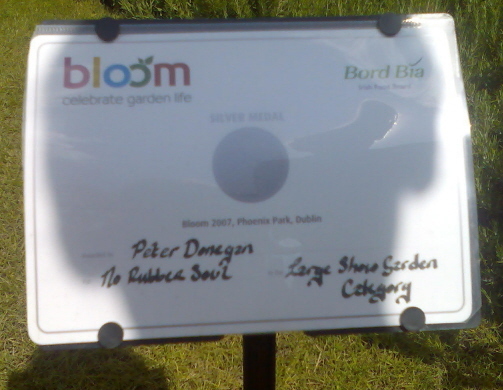 Peter Donegans garden design ‘No Rubber- Soul’ won silver in the large garden category in the inaugural year of Bloom in the Phoenix Park Friday 1st June 2007. 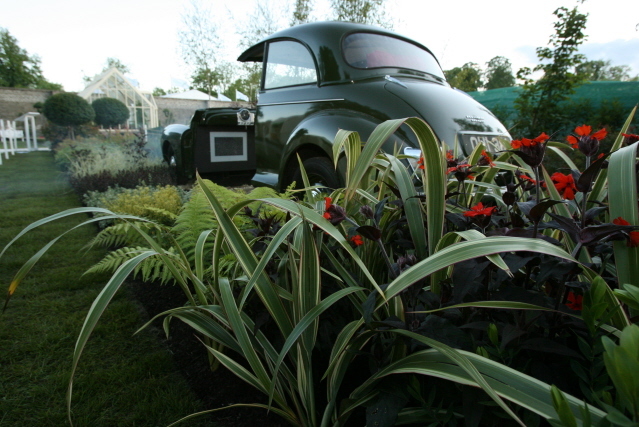 During the 20 day deadline over 1,500 plants; 50 square metres of rolled lawn; 4 tonne of recycled compost; 5 tonnes of recycled bark chippings; 6 tonnes of recycled tree stumps one 1965 morris minor and an outdoor flat screen television. 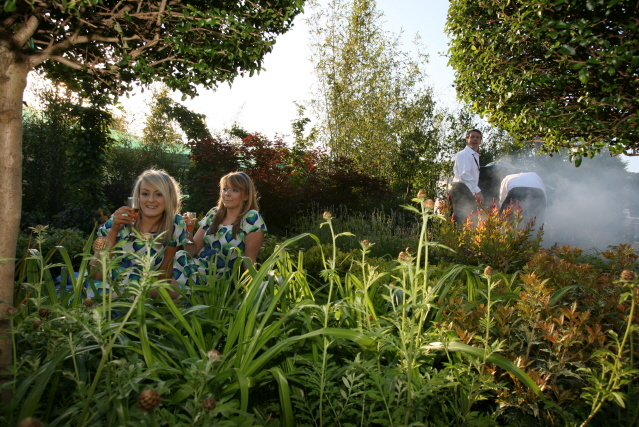 Despite the rainfall over the bank holiday weekend over 50,000 people still flocked to see the unsponsored garden. No decking, no paving, no additives or preservatives…. 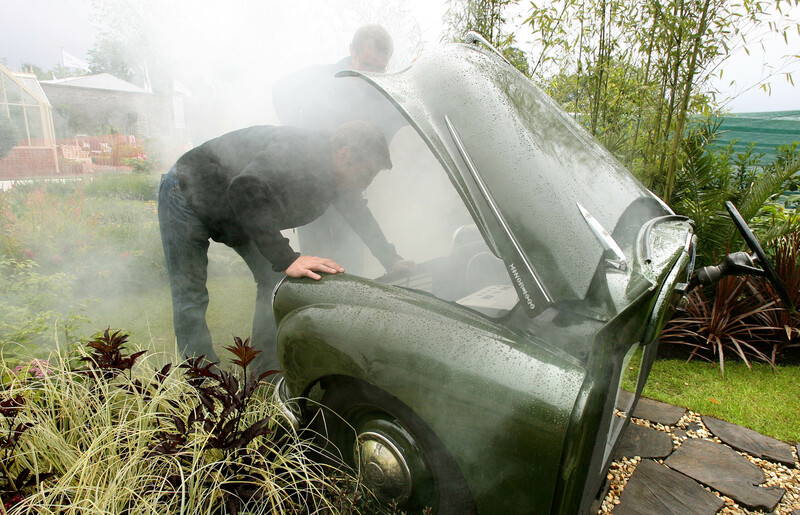 Imagine sitting within two thirds of a 1965 Morris Minor, watching the television, smokes plumes through the front grill of your car and you sit back and watch nature and plant life grow around you. This is the garden that has no rubber but lots of soul. Built from 100% recycled and/ or recyclable products. Take a trip back to 1965 when men used shovels and gardens had soul. Built to commemorate the many Irish men with initially, great intentions who promise to restore and rebuild projects but sometimes are never fully completed; it has been slightly adapted to via audio visual equipment to become an entertainment area of sorts and it should give the appearance that whilst unwillingly forgotten, the life of the garden continued to flourish around it. 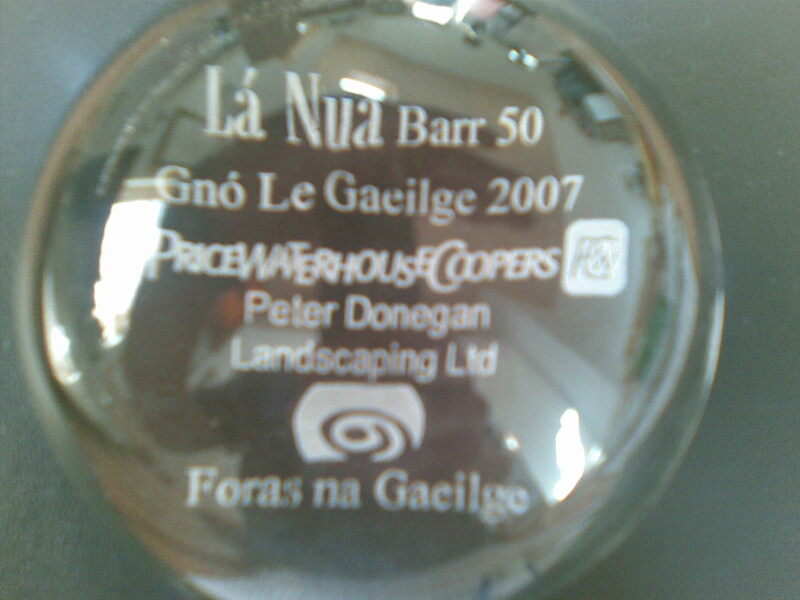 At The Four Seasons Hotel on June 1st 2007, in conjunction with Price Waterhouse Cooper and Forais na Gaeilge Peter Donegan MI Hort and Peter Donegan Landscaping Ltd joined Barr 50, the top 50 companies to operate through the Irish language. The awards recognize those who have made efforts in their industry to use the Irish language to improve their business. After making the website bilingual, initially, the company has slowly adjusted selections of his companies operations ‘as gaeilge’ and bilingual. 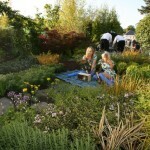 Peter Donegan Landscaping Ltd is the first horticultural related company to join the elite top fifty. 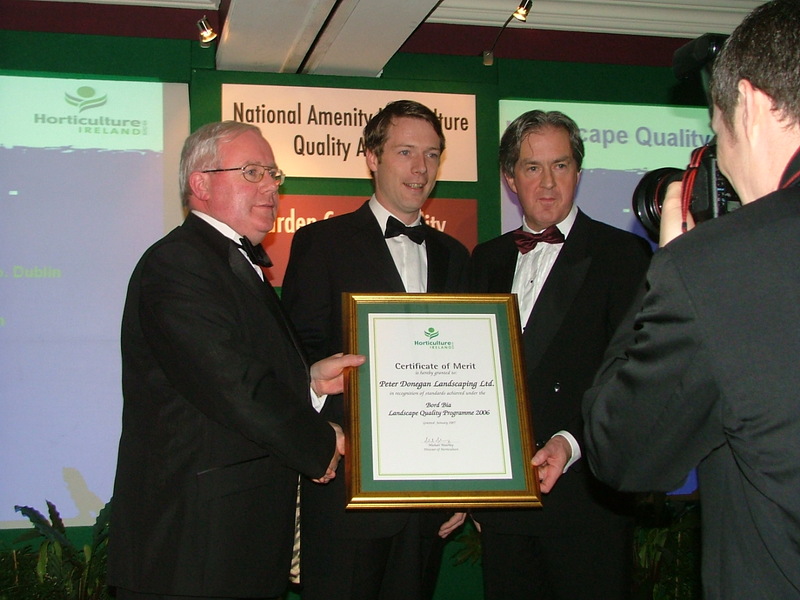 February 2006 saw Peter Donegan Landscaping Ltd receive a national award in recognition of standards achieved under the Landscape Quality Programme. 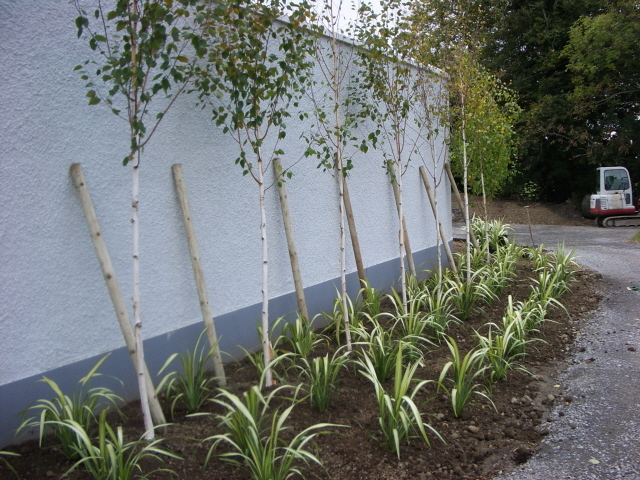 This the Donegan Landscapings second National award since October 2006 and the Donegan Landscaping team are one of only ten landscape & design companies in Ireland to have achieved the award. The Award of Merit was presented to Peter Donegan MD of Donegan Landscaping Ltd by Mr Brendan Smith, Minister for Horticulture and Food and Aidan Cotter CEO Bord Bia on Friday 2nd February at Citywest Hotel. 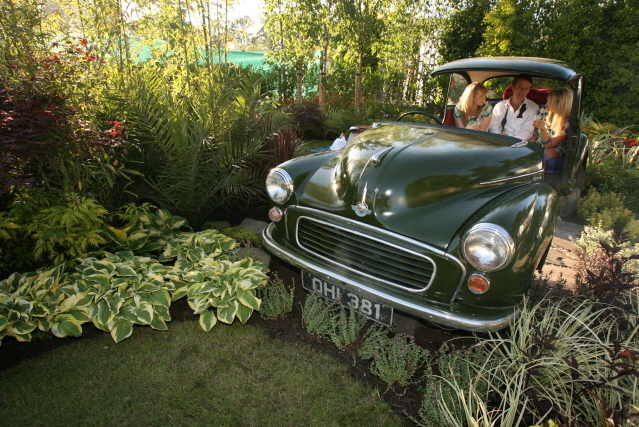 The award is the result of more than four years of hard work through a stringently audited programme that was designed to raise standards within the landscape industry and increase customer confidence by rewarding companies who operate an awarded quality system through best practice and at the highest standards possible to this sector of the horticultural industry.